This week, the acquisition everyone’s talking about is Amazon’s reported billion-dollar deal to buy pharmacy startup PillPack. But that deal was just the capstone on a busy quarter with 15 digital health mergers and acquisitions. The area of digital health shaken up the most by deal activity this quarter was certainly telemedicine. Both Teladoc and American Well picked up smaller telehealth firms to shore up parts of their offerings, and the world of enterprise telemedicine also saw a merger, the InTouch Health-Reach Health deal. Another trend to watch is consolidation in niche markets. The sleep tracking space came together as SleepScore Labs acquired Sleep.ai. The baby health space got a little smaller as Babyscripts bought iBirth. Finally, it’s worth noting one of the most interesting deals of the quarter is a reversal of one of the biggest deals of 2016, as Nokia sold its digital health business back to its founder— a timely reminder that not all acquisitions work out. Read on for a roundup of the 15 deals that defined Q2 2018. As usual, we’ll list the deals we know the price of first in descending order, then those with undisclosed terms in chronological order. 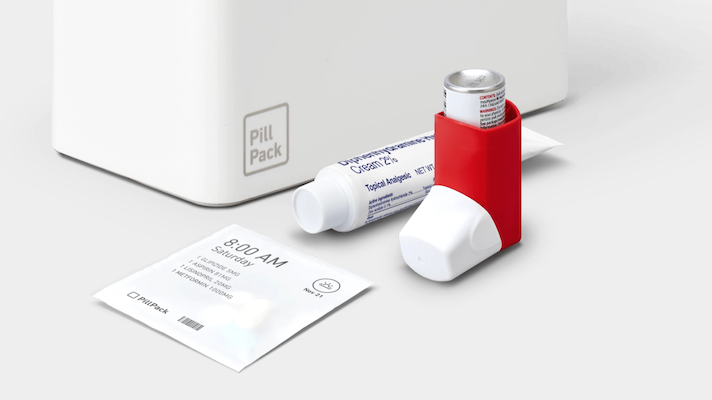 Amazon acquires PillPack — After months of rumors that PillPack was in talks with Walmart for an acquisition, online retail giant Amazon swept in and bought the company for just under a billion dollars (the terms of the deal were undisclosed, but the billion dollar number has been widely reported). With this, the company that made itself famous for “one-click shopping” for consumer goods is positioning to expand its services to include prescription medication — even as its healthcare JV with Berkshire-Hathaway and JP Morgan is starting to get off the ground. More. Teladoc acquires Advance Medical — Following up on last year’s Best Doctors acquisition, Teladoc picked up Advance Medical for $352 million. The move is expected to help Teladoc grow its global market into Latin America and Asia Pacific, and enable the company to provide care in 20 languages through its platform. CEO Jason Gorevic told MobiHealthNews that the services will be geared towards multinational companies, many that are based in the US but have roughly a third of their population in other countries, and international health insurance companies that are looking to enhance medical services. More. Medidata acquires Shyft Analytics — Medidata, a New York City-based company that offers cloud storage and data analytics services for clinical trials acquired Shyft Analytics, maker of a cloud data analytics platform specifically designed for the pharma and biotech industries, in June. The transaction valued Shyft at $195 million, inclusive of Medidata’s prior 6 percent ownership in the analytics platform, to be paid in cash. The two companies have come together to build a joint offering they call the “Intelligent Platform for Life Sciences.” Notably, this combined offering marries clinical and commercial information into a more comprehensive data platform that can be used to optimize value from the beginning of drug development to its eventual commercialization. More. Allscripts acquires HealthGrid — EHR vendor Allscripts made an agreement to purchase patient communication app maker HealthGrid for $60 million in cash, with an additional $50 million in earnout payments based on HealthGrid achieving certain revenue targets over the next three years. “The growing adoption of value-based care, combined with the modest level of usage of patient portals across the industry, has made it critical to take a new approach to patient engagement solution design,” Richard J. Poulton, president of Allscripts, said during the company’s Q1 earnings call announcing the acquisition. “We expect to tightly integrate the HealthGrid capabilities into our FollowMyHealth platform, adding functionality that would enable providers to reach 100 percent of their patient populations by leveraging existing patient contact information rather than requiring patients to sign up for the portal.” More. SCI Solutions acquires DatStat — Patient engagement and care coordination company SCI Solutions announced in April that it has acquired DatStat, a company that specializes in digital health tools and patient engagement, for an undisclosed sum. SCI Solutions’ platform is set up for patient scheduling, referral management, and revenue cycle software. Currently SCI Solutions is used by 1,000 hospitals and imaging centers, and by 13,000 physician practices. The company plans to combine this with DatStat’s digital self-service offerings, which include a tool for patients to prepare for their doctor’s visit, a secure messaging system, visit summaries, and care plans. More. SleepScore Labs acquires Sleep.ai — Contactless sleep tracker maker SleepScore Labs has acquired Dutch company Sleep.ai for an undisclosed sum. Sleep.ai, which was founded in 2014, specializes in wearables and apps that let users know if they are snoring. One of its products includes a wearable band can be worn on the user’s arm that vibrates whenever the user rolls on their back and starts to snore. The band also connects to the user’s phone. "Michiel and his team have made incredible strides improving sleep health for many customers who didn't even know they were suffering from snoring or bruxism," Colin Lawlor, CEO of SleepScore Labs, said in a statement. "We're excited to welcome both to the SleepScore Labs family and to expand our suite of life-changing sleep products.” More. Livongo acquires Retrofit — Digital chronic disease management company Livongo announced in April that it has acquired Retrofit, a company that specializes in weight-management and disease prevention programs, for an undisclosed sum. The acquisition will give Livongo customers access to Retrofit’s Diabetes Prevention Program. The move will also help Mountain View-based company expand its service, which gives users a ‘nudge’ to remember certain positive behaviors, by integrating more healthcare professionals into the system, including weight-management and nutritional services. More. American Well acquires Avizia — Boston-based American Well acquired fellow telemedicine company Avizia in late Q2 for an undisclosed sum. The deal is expected to help American Well grow its acute care capabilities, Avizia’s specialty. The deal will give American Well access to Avizia’s hospital-based cart lineup and custom software workflows for over 40 clinical specialties, such as telestroke and telebehavioral health services. “During the last few years we have been watching Avizia closely… and we really believe that the DNA, the culture, and the mission of the organizations are similar,” American Well CEO Dr. Ido Schoenberg told MobiHealthNews. “We also believe we offer this [platform] to a strong joint client base.” More. InTouch Health acquires Reach Health — On the same day as the announcement of the Avizia acquisition, InTouch Health, which develops enterprise telehealth technology for hospitals and health systems, announced its acquisition of Reach Health, another telemedicine platform. InTouch Health officials said the addition of Reach Health will help it broaden its footprint and enhance its ability to help its customers roll out telehealth programs across the continuum of care, while existing Reach Health customers will benefit from more robust support, reliability, security, and compliance. More. Eric Carreel re-acquires Nokia Digital Health (Withings) — After months of rumblings about rough seas for Nokia’s digital health business, Eric Carreel, cofounder of French health tech company Withings, bought back Nokia’s digital health division — two years after it was sold to the Finnish tech giant. Carreel plans to relaunch the Withings brand by the end of 2018, according to a statement. “I am delighted to start working again with the brilliant teams that made the brand such a great success,” Carreel said in a statement. “We have an exciting challenge ahead of us as we continue to push the boundaries of connected health.” More. Marlin Equity Partners acquires and merges Virgin Pulse and RedBrick Health — Employee wellness and health engagement platforms Virgin Pulse and RedBrick Health announced in May that they would merge under the Virgin Pulse name. The merger comes after Marlin Equity Partners' acquisition of RedBrick Health the previous week and Virgin Pulse that day, both for an undisclosed sum. The plan is to make both platforms’ capabilities available to their combined customers. The newly merged company will continue to support and innovate on both the Virgin Pulse and RedBrick platforms, according to the companies. Included in these offerings will be Virgin Pulse’s signature feature, the SaaS platform Virgin PulseEngage, which offers personalized, mobile-first experiences that support employees as they improve their health. The offerings will also include RedBrick Health’s digital and live coaching, health assessments, and biometric screening services. More. WebMD acquires Jobson Healthcare — Internet Brands subsidiary WebMD, which also oversees the Medscape brand of physician-facing mobile and web-based educational content, has acquired Jobson Healthcare Information, another healthcare content group, for an undisclosed amount. The major goal of the acquisition is to bolster Medscape's content across the board, but especially content for pharmacists and eye care professionals, including optometrists and ophthalmologists. Jobson will continue to operate out of its existing offices and offer many of its existing publications. More. Sophia Genetics acquires Biosoftware — Genomics AI company Sophia Genetics acquired Interactive Biosoftware, a maker of Alamut, a clinical decision support software for clinical genomic data interpretation. The terms of the deal were not disclosed. "We are very excited about the acquisition of Interactive Biosoftware," Jurgi Camblong, CEO and cofounder at Sophia Genetics, said in a statement. "Both Sophia AI and Alamut are technologies trusted by the healthcare community and focus on patient-centric innovation. The addition of Alamut marks a big step in our aim to help clinicians better diagnose patients equally. With a community of now over 900 teaching hospitals using our technologies we are in a unique position to connect clinicians and enable them to share knowledge." More. Wildflower Health acquires Circle — Wildflower Health, a digital health platform that helps patients navigate benefits and connect to resources, announced that it is acquiring Circle Women’s Health platform, a startup from the Providence St. Joseph Health Systems incubator. The merger is expected to grow Wildflower’s provider base as well as provide the team insight into the clinical space. The Circle Women’s Health platform was created by clinicians at PSJH to give users health information and resources. It provides various tools and trackers, and can be integrated into the system’s EHR. More. Babyscripts acquires iBirth — Babyscripts, a virtual care platform specializing in obstetrics management, announced in June the acquisition of the provider-delivered pregnancy app iBirth in an effort to flesh out its enterprise offering and further drive patient engagement. As part of the deal, the iBirth team will be joining Babyscripts’ team with the app’s CEO and cofounder Judith Nowlin taking on the new role of chief growth officer. No further terms of the acquisition were disclosed. Babyscripts’ platform offers providers a digital patient management dashboard with data collected through connected devices such as scales, blood pressure cuffs, and a patient mobile app. From these, the platform delivers insights identifying which patients may require a follow up or intervention. Currently the company collects an average of 2.5 and 1.5 weight and blood pressure readings weekly, company President Juan Pablo Segura told MobiHealthNews. By incorporating iBirth’s consumer app, his company expects a 500 to 600 percent increase in their weekly app usage, offering another source of data that can be leveraged to improve patient outcomes. More.